Madhavan (b. 1 June 1970, Jamshedpur, India), also called Maddy is an Indian actor. He used to act in Hindi serials and appear in commercials before he started his movie career. He currently acts in regional industries across India. Madhavan is also fondly known as the Chocolate Hero. Madhavan's parents are Ranganathan and Saroja and he has a sister named Devika. He is married to Sarita, and they have a boy - Vedanth. 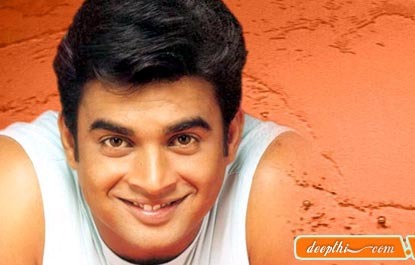 Madhavan was a popular face in Indian television even before he made his film debut. He acted in films, Hindi television serials like Saaya, Sea Hawks, Banegi Apni Baat, and Ghar Jamai. His debut in movies came in the form of Shanti Shanti Shanti, a Kannada movie. He also recently hosted the first season of Deal Ya No Deal. He got his first big break when Mani Ratnam introduced Madhavan to Tamil Cinema through his film Alaipayuthey (2000). Thereafter he has acted in successful Tamil films like Kannathil Muthamittal, Ayutha Ezhuthu (both directed by Mani Ratnam), Minnale, Run, Anbe Sivam and Parthale Paravasam. Madhavan made his Bollywood debut with Rehna Hai Tere Dil Mein, the remake of Minnale but unfortunately it was a flop. Maddy has come back with hits such as in Aayitha Ezhuthu, also directed by Mani Ratnam, he plays a negative role for the first time and has continued his success at the box-office with hits such as Priyasakhi and Thambi. He has even boosted his chances in Bollywood with the role of Ajay Rathod in Rang de Basanti. His next project looks set to be Mani Ratnam's Guru. He was also a part of Mani Ratnam's stage show, Netru, Indru, Naalai.